I've had these two colours on my mind, and all over my sewing room, for the past year because I've been working on my quilts for the special exhibition of Red &White quilts at this years Sydney Quilt Show. By coincidence the sewing machine I received as my Best in Show prize at the Australian Modern Quilt Show just happens to be red and white! 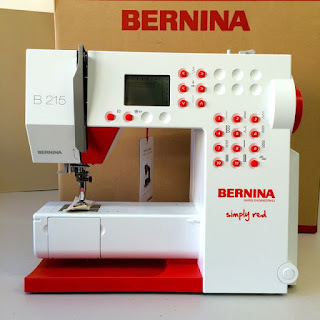 Yes, this model of the Bernina 215 is called "Simply Red", looks right at home in my sewing room. As I mentioned I did win this sewing machine but all of these words are my own. Bernina didn't ask me to do this blogpost. I should add this isn't really a review of the machine, I haven't used it enough for that, so think of it as more a sharing of first impressions. As I was unpacking the machine I was impressed to find this tag signed by a real person as a sign of quality control. I haven't had that from other brands of sewing machine. 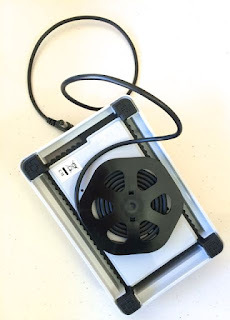 I had a funny moment when I was looking for the cord to plug in the pedal, Just when I was beginning to think they'd forgotten to include one I found it wound neatly underneath. This machine has lots of clever design details like that. Though I actually found using this machine very easy and straight forward to use. I double checked how to wind the bobbins but that was about all I had to look up in the the manual. The buttons are up front and obvious and there are just enough decorative stitches to keep a sewer happy. To take Simply Red though it's stitches and get to know it better I sewed white strips straight onto a piece of batting, sometimes flipping them over and other times leaving raw edges. Really just playing with simple improv lines. Of course I tried some of the fancy stitches too. 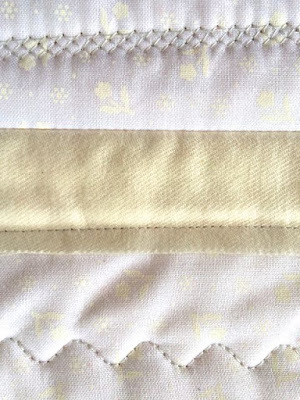 I was really impressed with it's steady sewing and neat, even stitches. 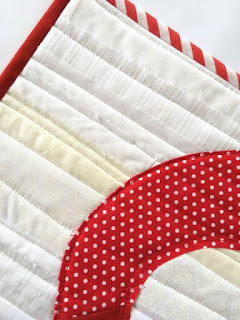 a Red & White mini quilt!! 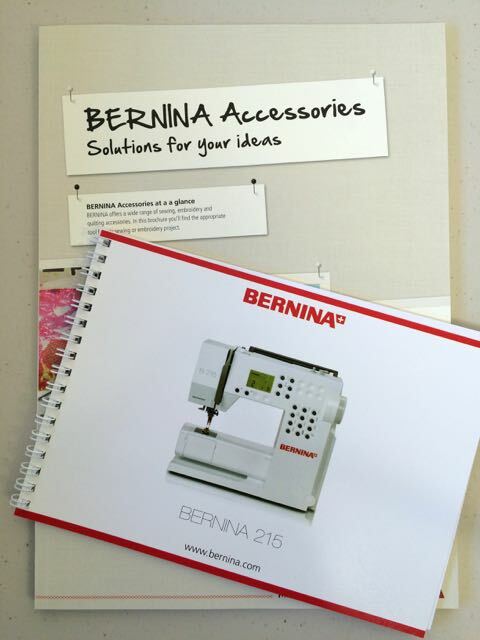 Thanks Bernina for sponsoring such a great prize!! I'm a very happy daisy to have received such a great sewing machine. I know Simply Red and I are going to have great adventures together. There's fun times are ahead for anyone attending the Sydney Quilt Show this week. I've been counting the days down as though it's Christmas, and well, I guess it will look a bit Christmassy to see so many red and white quilts in one place. I'll be there on Wednesday and Friday so if you see me say hello. And for those who can't make it I'm looking forward to sharing photos of my show quilts with you soon. I know you and Red are going to do great things together! I have to say, I LOVE my Bernina. I've had it for about 15 years now, and it is my all-time favorite machine. 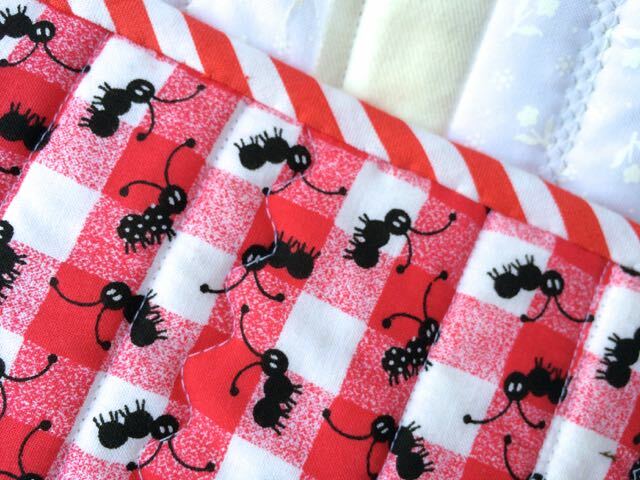 I can't wait to see all the lovely red & white quilts from the show! Have a great time! Simply red is so cute. How perfect that she matches your sewing room. Have fun at the quilt show. Farai cose stupende con questo nuovo giocattolo! Genius prize! Congrats on your win. You will use this for a long time I imagine. Can't wait to see pics of the Sydney "ribbons" too. Your new sewing machine looks simply gorgeous - congratulations again! I know how you feel about going to the Sydney Quilt Show - only 2 more sleeps. I hope Red gives you as many decades of stitching as my Bernina has. Only 2 more sleeps have a wonderful time. What a great prize! You will make lots of great things with it, I just know it. 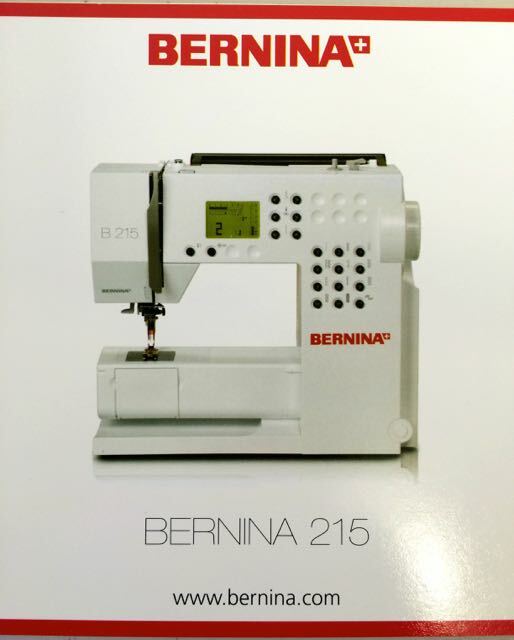 I have a Bernina and love it too. Red and white is my favorite combo just like your mini quilt says. And who wouldn't love a r&w Bernina machine! Congratulations! Wow! My Bernina isn't that colorful, but I love it just the same. Have fun at the show. Hope you meet in person lots of your blogging friends. What a great prize -- and she's pretty too! 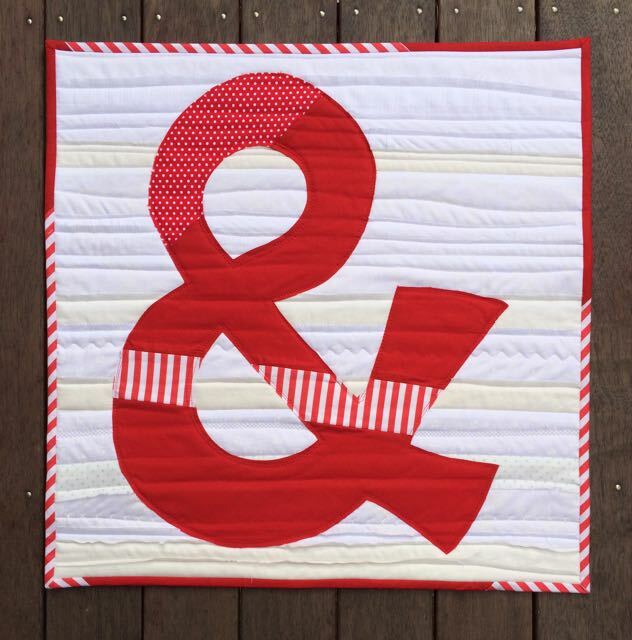 Take lots of pictures at the quilt show -- red and white sounds like it will be beautiful! in for a grown up one ? It is just a perfect size and Colour. And just in time for the Sydney show. I looked at all the prizes and wondered which one you will get because I KNOW you will get one!! You are a very lucky Daisy indeed! It looks like a lovely, compact machine! Congrats on taking a test drive on your new machine and making it into a project...maybe Bernina will use it as a project to encourage new buyers to do the same thing with their machines! RD! I'm so glad you have a RB (Red Bernina)! My Bernina was the most considered acquisition I' have ever made -- more so than my husband! And I have NEVER regretted it (nor my husband). They (Berninas, not husbands (not all the time, anyway)) are great work horses. I wish I knew how many miles (kilometers) I have sewn with my machine. Just give it a bit of care & it (he? she?) will love you back for a long, long time. What a cute machine, simply red is just what I'd name it too. Cute quilt, I think it'll be a nice reminder of your win. I hope to see you on Wednesday. I'll be hanging out at the awards with a friend. Nice machine! Extra special it will match your sewing space. Enjoy the show. I look forward to your pictures! 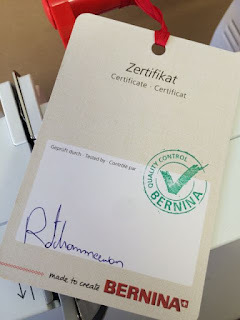 I've heard such good things about Bernina machines, a very appraise prize. Enjoy the Sydney Quilt Show! Simply Red looks super. Love all the red buttons, makes it look cheerful. Enjoy the Sydney Show, hope you win more prizes. How many quilts have you entered? How lucky are you to win such a great machine!! You deserve it, definitely. By the way, I just love red and white so I'm looking forward to all your pictures! How appropriate that your prize machine is a nice bright colour - nothing boring for your sewing machine. "&" is so much nicer than having a rough scrap with your test stitching. A nice reminder to hang on your wall. Have lots of fun with "Red". I love my Bernina although it is a mite too large to take along to sit and sews, but that is what hand piecing is for :) Simply Red looks to be a nice portable size, I know you will enjoy sewing on her. Lovely to read this about your Bernina Rachael....I'm so happy with my one as well! Happy Sewing! Enjoy the Quilt Show! 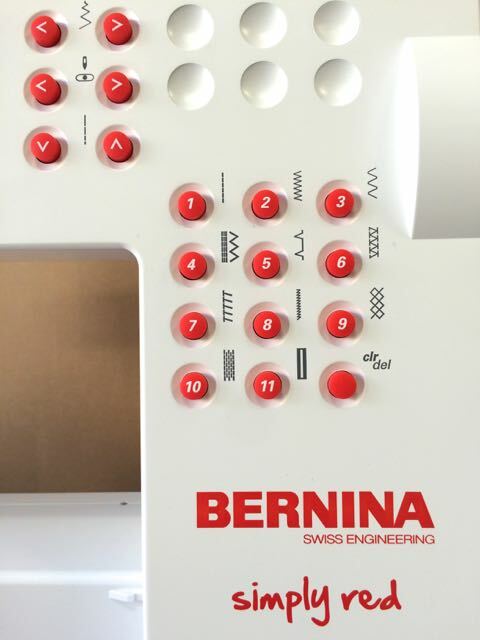 You lucky girl to have a Bernina and winning it makes it even sweeter ! Congratulations ! I want a Bernina....sigh, maybe someday. This one is sure cute ! Hello Red ! Nice to meet you. I just know Rachaeldaisy and you will have plenty of fabulous sewing time together. That's a great prize and a lovely mini. I'd like to hear your thoughts on Simply Red once you've used it a bit more. So wishing I could go to the Sydney Quilt Show. I really need to plan my year a lot better. Fingers crossed that I get there in 2016. Love the idea of all the red and white. Perfect. And it is wonderful to see your brand new machine. Simply Red is wonderful! I am an my third Bernina - just love them. And to see you ended up with a gorgeous mini quilt after playing is a good sign for this machine. Have a wonderful time at the quilt show. Looking forward to photos. Have fun the show! wish I was going. So, how did you win this? I must have missed something. How exciting!!! I love it and also your little & quilt. Very sweet and clever mini. What a fun machine! Wishing you and Red many happy hours of bliss together. Love the mini you made with "Simply Red." It must be extra fun to sew with a machine you've won!